Tagged under Yuuichi Takahashi, Satelight, Series. Whilst certain elements of the plot is certainly rushed owing to the time constraints of a movie and the Movie just doesn't really end with much of a bang to it - Sayonara no Tsubasa bears a stronger forte in the bonds between Arata , Ranka and Sheryl and it brings all the plot elements of the previous series into one package to tie it up neatly in a single movie package. The Mecha battles were also drastically improved and the dogfights grew more intense over time as the characters weave , spin and blast their way through their foes. 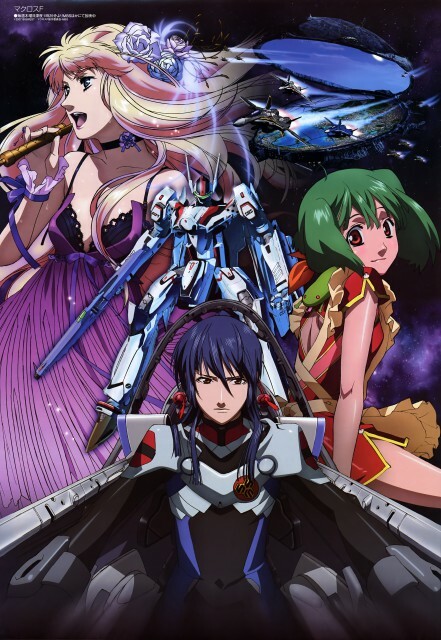 Of the newer Macross series this one reached back to the original in multiple sways and takes you back to where it all started. Boy meets girl. World is invaded by alians. But the overly used plot assure there is a real story here.though the pass of some of the episode lag. You see a real progression of characters you grow to care about. By the end I can promise you that the debate of which girl the princess should be with will drive you mad. Enjoyed the early episodes. Did a good job honoring the original series. The music and drawing was excellent. What I didn't like is the ending. I didn't understand who the "final boss" was, it was confusing. The love triangle was left unresolved, but then I felt lukewarm about triangle anyways. No chemistry. The main male lead was wishy-washy. It was a pretty good season overall. While not action heavy as the OVA versions of Macross series, it does lead to a ton of character development and though there is a movie in the works the series does a great job of drawing you into the Macross world and easily aligning you with which girl you can cheer for while poor Alto remains clueless...muahaha! The animation is great, the music is awesome, the characters are great too and the story goes pretty well but unfortunately it falls near the end of the story, with a different ending this would have been one of the bests animes ever.